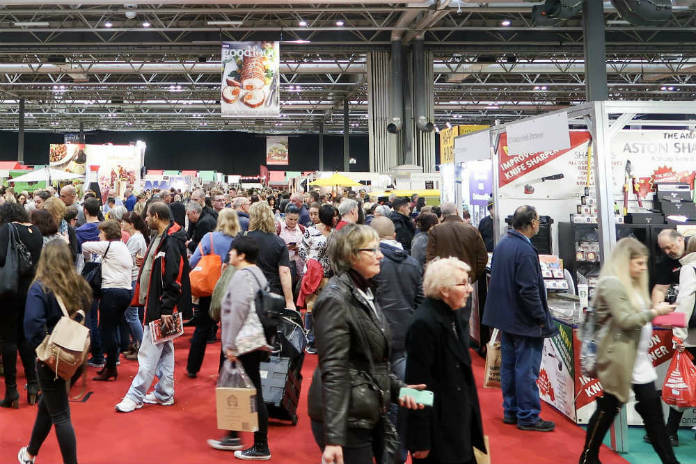 There’s always a big crowd at a BBC Good Food Show, and that’s no surprise because the shows make a fantastic festive day out! But the Winter show at the Birmingham NEC always seems to have an extra buzz about it. It falls just a few weeks before Christmas, and is an ideal opportunity to stock up on goodies for your Christmas party, buy some extra gifts or just celebrate the season. A busy diary meant that I visited the last day of the show this time around. But the final day of the BBC Good Food Show is just as fun and action-packed as the earlier days. You might even pick up an extra bargain if you’re lucky! I spent the first part of my visit looking around the Producer Village, which is full of small and artisan food producers. It’s always a great place to find some new products that I haven’t heard of before. And it’s also nice to see some of the familiar names coming back year after year! As I walked into the hall, with Christmas songs playing in the background, I was immediately greeted by the smiling faces on the Holy Lama Spice Drops stand. Spice Drops are one of my favourite products at the moment, because they are so versatile. I even included their Starter Kit in my Gift Guide for Food Lovers this year. So it was lovely to actually meet the people behind the brand. And that’s one of the things that I love about the BBC Good Food Show. The stands are full of people who are incredibly passionate about their products, and that really comes across when you meet them. On the Spice Drops stand, I tried a delicious, warming Chai made using their spice infusions. I also came away with a great tip, to use a drop of Black Pepper Spice Drops in my gin and tonic. One of the brands that I hadn’t seen before was Shropshire Salumi. They are based just down the road from me, near to Shrewsbury. I tried their fantastic range of salami which are great quality, and really full of flavour. They sell their products at farm shops and farmers’ markets across Shropshire, so it’s definitely worth checking them out if you get chance. I was also really impressed by McLaren’s Christmas puddings. These little beauties are made with cognac and Guinness, and they use butter instead of suet. This gives the puddings an amazing light texture, but without losing any flavour. It also means that they are suitable for vegetarians. If you’ve ever thought that Christmas pudding can be a bit on the heavy side, but love the rich flavour and tradition, then these are definitely worth checking out. The BBC Good Food Show is also a great place to discover totally new products that you had never heard of before. I stopped by the Smoky Brae stand when their Smoked BBQ Box and Smokey Mini Hamper caught my eye. But what really got me excited was their Smoked Sugar. This was originally created as the basis of a smoky barbecue sauce, perfect for sticky BBQ ribs. But just imagine it used in a smoky caramel sauce, or smoky fudge, or even decorating a Christmas cocktail glass. The possibilities are endless! Of course, it’s always a good idea to go to the BBC Good Food Show hungry. There are lots of samples to be tried as you walk around! As I walked around the Producers’ Village, I was stopped by Mariano from Amar Food. They sell a wide range of truffle based delicacies, and Mariano took the time to run through some of them with me. Truffles are such a luxurious product that you might not think to use them in your own cooking. But the Amar Food range means that you can easily add this delicious ingredient into recipes. I sampled the Porcini Mushrooms with Black Truffle, and the White Truffle Cream. Both were so delicious, they’d really add a special touch to your festive menu. The Platinum Gift Box would make a great gift for any foodie friend or relative, or you could really splash out on a White Truffle! You can buy these products and much more from the Amar Food website. But the BBC Good Food Show isn’t just about sampling and buying food and drink. You can also learn new skills and discover some great new recipes from top chefs. The Friends and Family Festive Kitchen was looking very popular. It was sponsored by Kelly Bronze, and visitors were picking up some fantastic tips for making their Christmas Dinner extra special. Meanwhile, over in the Sampling Theatre and Pavilion, Taste of Ulster were introducing visitors to some of the area’s best food and drink. Northern Ireland produces everything from cheese and butter, exquisite chocolates and delicate macarons, through to cider, gin and even vodka. I haven’t yet visited Northern Ireland, but I’m definitely hoping to put that right soon! You also have the chance to meet top cooks and chefs at the BBC Good Food Show. When I was passing through David Myers and Si King, better known as the Hairy Bikers, were busy meeting and greeting fans, and signing copies of their books. And if you’re not driving, then the show is a great place to sample some delicious drinks. The Yellow Tail wine stand was very popular, both for their samples and for the funky yellow camper van! I was also very happy to see Glen Moray exhibiting at the show, and popped onto their stand for a chat. I visited Elgin earlier this year, but didn’t have time to visit the Glen Moray distillery while I was there. So they talked me through their range of whiskies, including the Glen Moray Classic Port Cask finish whisky. It is finished for eight months in port casks, which gives it notes of chocolate, vanilla and rich dried fruits. It would be perfect to drink at Christmas time! They have some lovely gift sets available, which you can find on the Glen Moray website. And if you are up in the North of Scotland, which is a beautiful part of the world, and have chance to visit Elgin, do try to visit the distillery while you’re there! Of course, I sampled some gins while I was at the show as well. I will be bringing you my favourite picks in another post very soon. And my final pick from this year’s BBC Good Food Show was something very different. Seedlip produce a range of copper pot non-alcoholic distilled spirits. If you’ve ever felt that mocktails and soft drinks are a bit too sweet for your taste, then these are just what you are looking for. I tried the Garden 108 which is described as herbal, with notes of peas, spearmint, rosemary and thyme. It’s kind of like a savoury version of a floral drink, if that makes sense, and would mix well with a mediterranean tonic water. To me, this was a drink that would be perfect for the summer months. But my favourite was the Spice 94, which has notes of All Spice, Cardamon, Lemon and Grapefruit. It’s warm, spicy and aromatic, a perfect winter drink. With this on offer, I’d never feel that being the designated driver meant an evening of boring drinks! You can find a list of stockists and a selection of recipes on the Seedlip website. Those are my favourite picks from the BBC Good Food Show for Winter 2017. I can’t wait to see what I can discover at next year’s shows!